Often we think creativity is about producing something and putting ourselves out there. 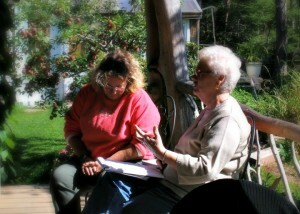 But real creativity involves listening and becoming receptive and aware. When we learn to pay attention to our inner voice, we are better able to develop more productive and appropriate personal habits, and encourage the outflow of ideas and insights. In this way, our creativity can work with us and for us in the workplace as well as our personal lives. Creative writing exercises have proved tremendously helping in leading others discover (or rediscover) their worth and value, their desires and motivations. Certainly, my recent experiences in Haiti showed me how valuable writing can be to empowering individual change. 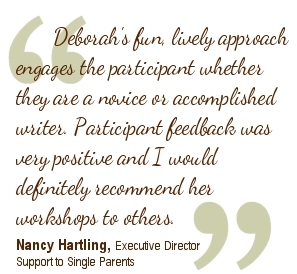 Through fun and inspiring writing exercises, participants also learn to appreciate and recognize their colleagues’ skills, talents, and stories, leading to more cohesive working relationships. To dream or imagine something into being, stretches our abilities and feelings of self-worth. That dream may involve words or art or music … or it may involve imaging a new way of doing things, enhancing the workplace, improving customer service, or jury-rigging a piece of machinery to do a better job. Using our creative talents in the workplace benefits all. I will customize an existing creative writing workshop or create a new one that enhances your health and wellness or professional development initiatives, time frame, workplace culture, organizational goals, or the theme for your conference or special event. It can be fun, serious, inspirational, or creativity-boosting.